A popular sausage brand is recalling more than 48,000 pounds of frozen raw pork patties, sold at Walmart, Kroger and other major grocery chains, due to concerns they may contain rubber. The problem was discovered after three consumers complained of black rubber in the product, according to the U.S. Department of Agriculture. 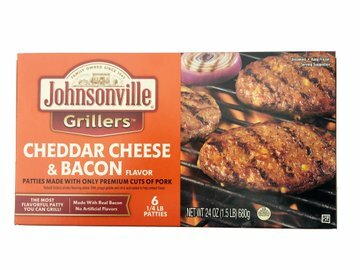 The agency said there have been no confirmed reports of adverse reactions as a result of the possible contamination.The recall involves “Johnsonville Grillers Cheddar Cheese & Bacon Flavor” 24-ounce, or 1.5 pound, products, packaged in a plastic bag in a carton, the USDA’s Food Safety and Inspection Service said in a release. Produced and packaged in September and October, the affected items have the number “34225” printed on the carton. The products also have “best flavor by” dates of July 24, 2019, Aug. 13, 2019, or Aug. 14, 2019. The USDA urged consumers to check their freezers for the recalled products, which it said should be thrown out or returned to the store for a refund. Sheboygan Falls, Wisconsin-based Johnsonville LLC said it shipped the recalled product to retail stores in 30 states: Alabama, Arkansas, Arizona, California, Colorado, Florida, Georgia, Illinois, Indiana, Kansas, Kentucky, Louisiana, Michigan, Minnesota, Missouri, Mississippi, North Carolina, North Dakota, Nebraska, New Mexico, Nevada, Ohio, Oklahoma, South Carolina, Tennessee, Texas, Utah, Washington, Wisconsin and Wyoming. Walmart posted the recall for the product sold at some of the retailer’s stores, as did Kroger. The incident is not the first of its kind. In May, another Kroger supplier, JBS USA, recalled more than 35,000 pounds of raw ground beef because of possible contamination with hard pieces of plastic.